The Institution’s Arms were granted in 1994. The design follows medieval tradition, but incorporates features that are especially relevant to the IAP. The Y-shaped ‘pall’ symbolizes the choice between two paths – the yes/no of binary arithmetic. 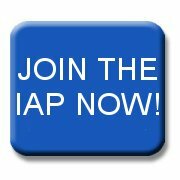 Lightning bolts symbolize the power and speed of the electricity that runs our machines, and possibly even the flashes of inspiration that all IAP members pray for! The ‘pierced lozenge’ is the heraldic symbol of the common man, but looks uncommonly like a floppy disk. Riding on top is the ‘pantheon’ – a mythical creature representing wisdom, and holding the universal symbol of all knowledge. The “mantling” which surrounds the shield is a reminder of the medieval Crusades, when knights wore cloth over their helmets to protect them from the hot sun of the Holy Land. Inevitably this cloth became somewhat tattered in skirmishes along the way. In heraldry tattered mantling is still used as a symbol of overseas enterprise, acknowledging the IAP’s international links. The motto of the Institution, “Logic is my Servant”, is written in Esperanto: the language designed to unite the world. The Institution’s Coat of Arms may be used by members subject to Council Approval. Further guidance is available in the Members’ Area under Business Support.